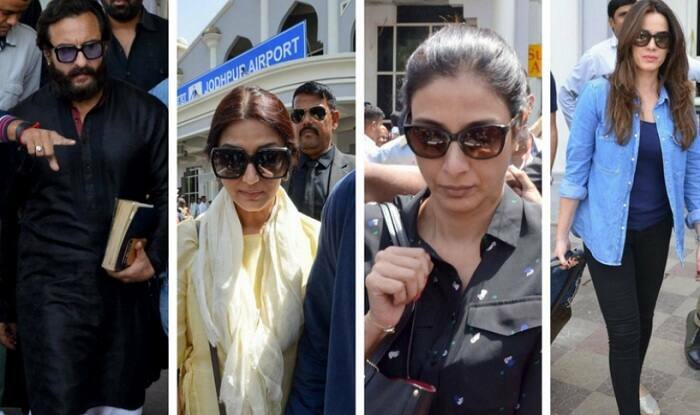 New Delhi, April 6: While Bollywood superstar Salman Khan was awarded five years jail in the 20-year-old blackbuck poaching case under Section 9/51 of the Wildlife Protection Act, his ‘Hum Sath-Sath Hai’ co-actors Saif Ali Khan, Sonali Bendre,Tabu and Neelam, who were also named in the case walked free. If reports are to be believed, the other Bollywood stars were given the ‘benefit of the doubt’ as their intention of ****ing black bucks could not have been established in the court. Salman Khan,who was accused main accused of ****ing two blackbucks in Kankani village near Jodhpur on the night of October 1, was in a more precarious position than any of his ‘Hum Sath-Sath Hai’ co-stars. While pronouncing the verdict in the case Chief Judicial Magistrate Dev Kumar Khatri called Salman a ‘habitual offender’ and ruled that this is why the actor had been convicted, while the others had been given the benefit of the doubt. On Thursday, Salman was taken to the Jodhpur Central Jail amid tight security. He spent his night in barrack number two as kaidi number 106. The prison houses ****-accused Asaram Bapu, Bhanwari Devi ****** accused Malkhan Singh Vishnoi and Shambhu Lal Regar, arrested for ****ing a Muslim and blatantly filming the act. In jail, the actor refused to had his dinner (dal, roti, potatoes and cabbage). ‘Dabangg’ Khan had yesterday sought bail but his application will be heard on Friday . in the Jodhpur sessions court. If the bail does not come through, he will have to stay in jail for at least three more days as the weekend follows. This is the fourth time, the Bollywood superstar was sent to Jodhpur jail. Earlier in 1998, 2006 and 2007 he had spent 18 days in the jail.